Tell Me Another, Carol Brendler! I've got some terrific news to announce today—not a debut book, but a debut novel, and a most wonderful one at that! Carol Brendler's TELL ME ANOTHER tells the story of fourteen-year-old Cece, who lives in Newark in 1938 and wants nothing more than to be a radio star, preferably alongside her crush, Orson Welles. Steeped in the glitzy world of broadcast radio, this is a story that captures late '30s-era New Jersey and New York to a T. The novel culminates with Orson Welles's infamous "War of the Worlds" broadcast, which sparked a rush of panic across New Jersey—an event which was also experienced firsthand by Carol's father, making this particular book deal all the sweeter. I am so pleased to announce that TELL ME ANOTHER has sold to Holiday House, for publication in Fall 2013 (the 75th anniversary of the Welles broadcast), and was acquired by Pam Glauber and Mary Cash. Huge congratulations, Carol—or, as Cece would say: Yowsah! Many years ago, there was a little girl who loved to ice skate. Little did that girl know that she would one day grow to bring her love of ice skating to life... in the form of a picture book! In a lovely full-circle moment, this week Tara Lazar has accepted a publication offer for her picture book, LITTLE RED GLIDING HOOD, which will be published by Random House Books for Young Readers, with editor extraordinaire Heidi Kilgras at the helm. LITTLE RED GLIDING HOOD is set in an enchanted forest populated by all your favorite fairy tale characters, and centers upon our ice-skating, red-hood-wearing protagonist's search for a partner to team up with in the doubles skating competition. The prize is a new pair of ice skates, which Little Red desperately needs. But can she really find someone who is able to keep up with her fancy figure eights and willowy waltz jumps? For those who are keeping track, this is Tara's third picture book currently under contract, with THE MONSTORE due out June 2013, and I THOUGHT THIS WAS A BEAR BOOK set for 2014 (both from Aladdin/Simon & Schuster). Hooray and congratulations to Tara! Happy June from EMLA! Is there sunshine where you are? We hope so! Transcendence by C. J. Omololu introduces Cole, a cello virtuoso, who is beginning to remember her past lives, just as an enemy from one of those lives resurfaces with revenge in mind (published by Walker). 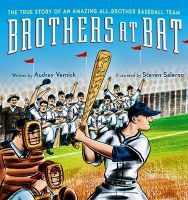 And The Bulletin of the Center for Children's Books has handed Audrey Vernick yet another star for BROTHERS AT BAT: THE TRUE STORY OF AN AMAZING ALL-BROTHER TEAM, making five with Shelf Awareness! So few books are so universally praised; we are of course delighted! I’m thrilled to announce today that another debut author has found a wonderful home: Laurie Thompson, non-fiction author extraordinaire, has just sold her first picture book to Anne Schwartz at Schwartz & Wade! When Emmanuel Ofosu Yeboah was born, his right leg was short and twisted—completely useless. It was 1977, and people with disabilities in Ghana, West Africa, were considered cursed, and left their homes only to beg for food or money. Emmanuel challenged the norm from his youngest days. Then, in 2001, he decided to prove that people with physical challenges could do amazing things, so he bicycled across Ghana—almost 400 miles—with one leg. His ten-day ride helped make him a virtual celebrity, but also a national hero. As a direct result of Emmanuel’s efforts, Ghana eventually enacted progressive disability laws. ﻿Laurie first became interested in this story after seeing Yeboah on the Oprah Winfrey Show in 2005, where he was promoting his documentary film Emmanuel’s Gift, which Winfrey narrated. (Oprah said of the documentary, “I think every parent should go take their children to see this movie because it will change the way your children think about what they can do and can be.”) I, for one, can’t wait to see the experiences of this amazing man brought to life on the page. All you readers out there have a treat in store for you, for sure! A star for Flying the Dragon! A star from Kirkus for Natalie Dias Lorenzi's FLYING THE DRAGON! When her cousin unexpectedly moves from Japan to Virginia, a Japanese-American girl finds their cultural differences embarrassing until kite fighting unites them. Skye’s Japanese father has not seen his family since marrying her American mother and moving to Virginia. Skye knows some Japanese, but she’s an American kid, obsessed with soccer. Her Japanese cousin Hiroshi speaks some English, but he’s thoroughly Japanese and loves making and flying kites with his beloved grandfather. Everything changes when Hiroshi and his family relocate near Skye’s family for Grandfather’s cancer treatment. Skye’s parents enroll her in Japanese classes, jeopardizing her dream to play on the All-Star soccer team. Hiroshi, meanwhile, has lost his chance to compete in his town’s annual rokkakukite battle. As Skye struggles with Japanese and Hiroshi struggles with English, both feel angry and frustrated. Ashamed because Hiroshi’s different, Skye fails to help him acclimate to fifth grade, where he feels like an alien. Hiroshi resents sharing Grandfather with Skye, until Grandfather’s health fails, and the cousins find common ground. Skye and Hiroshi’s American and Japanese perspectives emerge gradually through alternating chapters, while their grandfather functions as a pivotal character whose wisdom and legacy binds them. Details of Japanese language, culture and kite fighting enhance the diversity theme.